A building may have a boiler or a furnace. A furnace heats air and then a blower forces the air into the duct system throughout the building. 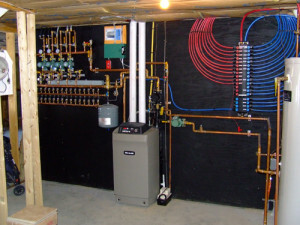 A boiler heats water, and then the heat is transmitted to radiators and heating outlets via piping. Both require electricity, making efficiency important when considering which to purchase. High efficiency boilers are not as common as high efficiency furnaces; however, they are becoming more popular. High efficiency boilers are the future, and here are a few reasons why. High efficiency boilers are typically more expensive than regular boiler units. However, high efficiency boilers can pay themselves back, and more. First of all, they are more environmentally friendly and produce minimal emissions. Secondly, they transfer energy more efficiently, which saves energy, and expenses. There are also tax credits available for application when using Energy Star high efficient equipment. High efficiency boilers eliminate the need for a chimney. The waste products produced by high efficiency equipment are simple to dispose of. Typically, high efficiency boilers can dispose of waste products through small vents built into the building. These vents can be installed on the sides or on the roof of the building. Older boilers have a pilot light which constantly runs, and must be manually lit when it burns out. New high efficiency boilers have an electronic ignition system that is automatically regulated. If the boiler is not in use, then the electronic computer system shuts off the ignition in order to save energy. This helps the building owner save money on expenses, which adds up over the life of the boiler unit. Bigger isn’t always better. The newest boilers have the best technology, but they are the smallest units ever created. New high efficiency boilers take up significantly less space than the older boiler units, and are more effective. The new boilers are typically wall mounted, which can leave your basement with some extra open space. The more efficient sizing of the new boilers can be important when one only has small spaces to work with. Simply put, sensors are the future. Nearly everything can be made more efficient as sensor technology advances. High efficiency equipment, such as boilers and furnaces, has technological advancements that older models did not have. The newest sensor technology has created the most efficient boilers ever, with some reaching up to 99% efficiency in clinical trials. Although the initial cost of replacing a boiler may seem high, it is well worth the investment. The newest high efficiency boilers are capable of paying themselves back in energy savings. Tax credits are also available for people who use high efficiency equipment in either a residential or commercial setting. With more intelligent technology in the ignition system and sensors, energy efficiency is maximized for the newest units.